Juan R. Pimentel - Kettering Univ. Safety has been ranked as the number one concern for the acceptance and adoption of automated vehicles since safety has driven some of the most complex requirements in the development of self-driving vehicles. Recent fatal accidents involving self-driving vehicles have uncovered issues in the way some automated vehicle companies approach the design, testing, verification, and validation of their products. Traditionally, automotive safety follows functional safety concepts as detailed in the standard ISO 26262. However, automated driving safety goes beyond this standard and includes other safety concepts such as safety of the intended functionality (SOTIF) and multi-agent safety. The Safety of Controllers, Sensors, and Actuators addresses the concept of safety for self-driving vehicles through the inclusion of 10 recent and highly relevent SAE technical papers. Topics that these papers feature include risk reduction techniques in semiconductor-based systems, component certification, and safety assessment and audits for vehcicle components. 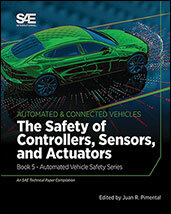 As the fifth title in a series on automated vehicle safety, this contains introductory content by the Editor with 10 SAE technical papers specifically chosen to illuminate the specific safety topic of that book. If you do not have access to SAE MOBILUS via username/password or institutional access, you can still purchase the Progress In Technology (PT), The Safety of Controllers, Sensors, and Actuators: Book 5 - Automated Vehicle Safety.